Living Stations of the Cross *Due to unforeseen circumstances, this year’s Living Stations of the Cross has been canceled. Morning Prayer from the Liturgy of the Hours • 9:00 a.m.
Confessions: 9:30 a.m. to 10:30 a.m. • 3:00 p.m. to 4:00 p.m.
Mass of the Lord’s Supper • 7:00 p.m.
Adoration of the Blessed Sacrament following Mass until 11:00 p.m.
Night Prayer from the Liturgy of the Hours • 10:30 p.m.
Confessions • 9:30 a.m. to 10:30 a.m.
Solemn Commemoration of the Lord’s Passion • 3:00 p.m. and 7:00 p.m. The Liturgy includes the Reading of the Passion, Intercessions for all the People of the World, Veneration of the Cross, and Holy Communion. 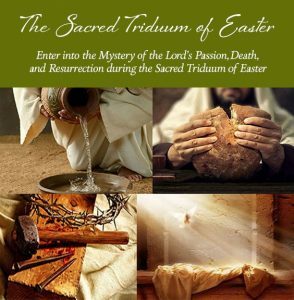 Blessing of Easter Food • 12:00 p.m.
Solemn Vigil of Easter • 8:00 p.m.
Mass includes the Blessing of the Easter Fire and Candle, the Easter Proclamation, Blessing of Water, and the Sacraments of Baptism, Confirmation, and Holy Eucharist. Masses: 7:30 a.m. • 9:30 a.m.• 11:30 a.m. • 7:00 p.m.
All Masses include the Renewal of Baptismal Promises and Sprinkling with Holy Water.